As a holiday gift, Nikon has delivered Windows 7 compatibility for Capture NX2 and Capture Control Pro 2 users. Mac users were not left in the cold, as Capture NX 2.2.3 also supports Mac OS 10.5.8 and Control Pro 2.7.0 works with OS 10.5.8 and 10.6.1 (links to Nikon USA downloads). Let Nikonians Help Your Holiday Shopping! Still looking for that perfect gift for your favorite shutterbug? Let Nikonians help you with your Holiday Shopping! Every Nikonians member has access to the Rewards program, with exclusive deals and discounts on some of the finest and discriminating photography products from established and highly reputed retailers. These are a small sampling of the amazing deals, products and discounts that Nikonians members have exclusive access to. Be sure to visit the Rewards page and start checking off your holiday shopping list today! Ten years ago, Swarovski redefined elegance and ease of use in hand held optics with the world's first wrap-around grip binoculars. Today, the EL42 Optik range is setting new standards yet again, with the the revolutionary SWAROVISION technology. Equipped with high-end features such as field-flattening lenses to minimize distortion, flouride elements to enhance color and reduce fringing and large eye relief to allow 100% vision even with spectacle users, SWAROVISION brings the hand-held binocular to an entirely new level of standards. The ergonomics of the Swarovski Optik EL42 series has also been enhanced. Two turns of the focusing wheel brings you from Infinity to the close-up distance of five feet (1.5m) and the legendary wrap-around grip allows ease of handling, even with thick winter gloves. At a feather-light 28 ounces (795 gr), the EL42 series does not compromise weight for it's amazing optical performance. Click here to learn more about the Swarovski Optik EL42 and other outstanding optical products. The Optik EL42 will be available January 2010. With Nikonians Annotate software (free download), you can easily share comments on images without destroying the original. The new version 1.10 is free and makes it possible to annotate and share multiple images easily. We have now an online help on Annotate in our wiki. You ask why you need to store comments in the image header and not to draw them directly on the images? Your comments are stored in the image as text. Unlike hand drawn comments on the image, text can be processed and indexed by your computer, which will allow you to quickly search within annotations to e.g. find people in your photo catalog. Advanced search functionality is coming in future versions of Annotate!, but you can start tagging people in your photographs right now! Creating comments with Annotate! is fast. Try Annotate! yourself and see how fast it is to comment on specific parts of the image. Annotate! is lightweight. You do not need to use complex digital photo editing software to put simple comments in your images. You will find out that loading an image in Annotate is as easy as dragging the image from a web page opened in your web browser. Annotate! can also run in your system tray, waiting to be used anytime you need it to e.g. take a screenshot or crop images. For the MP3 version of this podcast (audio only) click here (16.7MB). If you're looking for that special gift for a friend or relative (or even yourself) don't forget the special membership discount vouchers that come with the NikoniansPress books series. 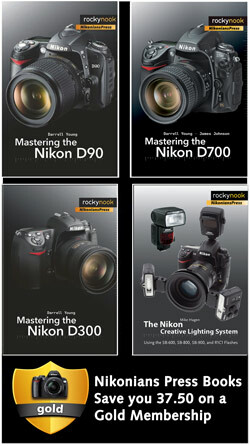 Mastering the Nikon D5000, by Darrell Young -- our fifth in a series of books in the joint venture between NikoniansPress and publisher Rocky Nook -- will start shipping soon and this might be a good time to get your pre-order discounted price in time for the holidays. This is our fifth in a series of books in the joint venture between NikoniansPress and publisher Rocky Nook and all five include a special Nikonians 50%-off voucher discount for a one year Gold Membership in the Nikonians community. This will save you $37.50 USD. Nikonians featured blogger is Rick Paul. Learn how to take your photography passion into becoming a business. Follow Rick's own first steps moving his business forward. More in Rick's blog. Well, you don't really have to shoot yourself literally. All you need to do is submit a video of 140 seconds or less with the theme "Your Day" and you can win. Nikonians in the USA 50 states and the District of Columbia age 18 or above are invited to enter Nikon's "A Day through your Lens" video contest with a deadline of December 15th at midnight. So what's it like to be you? Capture the essence of your day in a video of 140 seconds or less. It can be funny, touching or profound. It can be about everything you did, everything you didn't do, the day's biggest dilemma or its most telling detail. The contest promotes Nikon's HD-video capable D5000 camera, but the neat part is you can shoot your entry with any video-capturing device that can produce videos in one of the following formats: flv, avi, mpg, mpeg, mpe, dat, vob, wmv, asf, mp4, mov, 3gp, 3gp2, 3gpp, dv, qt, rm, or rmvb. The grand prize is $100,000 and a Nikon D5000 D-SLR kit. This contest has an audience viewed popularity feature, which means if your video gets a pile of audience reaction you could win $25,000 and a Nikon D5000 D-SLR kit. 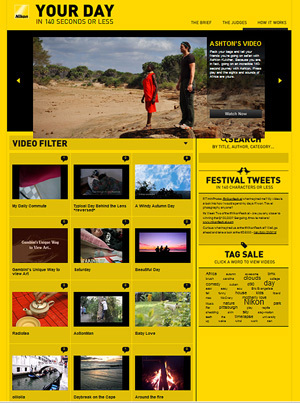 You can find the rules and submission guidelines here, and follow the contest at the Nikon Festival site. "Note: Please do not use music, brand images or talent that you do not have permission to use in your video. If you're going to put music on your video it's best to use music that is in the public domain or music that you have created." Our recently completed photo contest which awarded prizes to new members was so popular that we're launching an extended seven-week Phase V which will last for the rest of this year. In this fifth edition of the New Members Welcoming Photo Contest We are giving out one Photo Mechanic by Camera Bits (currently valued at $150 USD, with a media price of $160), once every week for a series of four weeks. Then, the following three weeks we are giving out a GPS unit courtesy of buyGPSnow. Each week we will select a winner. The final winner in this series will be announced January 4, 2010. Winners will be announced at the Nikonians Photo Contests Forum. Carl Zeiss has announced a line of lenses for "the semi-professional" market. Labelled ZF.2, this family of manual-focus lenses will mount and meter with Nikon F-Mount 35mm camera bodies. While no samples were available at press time, the optics line-up covers popular focal ranges from 18mm to 100mm. The CPU now reports EXIF information to the mounted body such as exposure based on selected aperture; which eases the photographer's workload in managing settings. Overall, the price and maximum aperture reflects the targeted enthusiast market. Zeiss quotes an MSRP of approximately USD800 to USD2100 depending upon the model making the threshold somewhat more accessible to the prosumer. We are updating the forums and the reviews sections on Nikonians in the coming days. More details will be posted as the updates are rolled out. Berger Brothers is offering a great deal for Nikonians Members on the hot selling Nikon D3s and the latest Nikkor lenses like the 85mm f3.5 VR and the revised models of the 70-200mm f2.8 VR II and 18-200mm VR DX II. With every purchase of any of these items, you get the Joby GorillaPod Tripod free - a USD50 value. All these items ship free, so get started on your holiday shopping today! The caps have been won! Ron Batchelder and Jay Horsley are the winners. 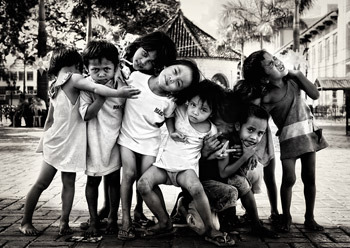 Congratulations to Nikonians Gold Member Voltaire Malazarte (Alaz), of New York, USA, winner of the Best of Nikonians - 2009 Images Photo Contest October segment with his image "Children of lesser God." Voltaire's photo is a Black and White conversion of street children jockeying for better positions at the famous Magellan's Cross historical site, in Cebu, Philippines. He used his Nikon D700 and AF-S Zoom-NIKKOR 28-70mm f/2.8D IF-ED lens at 52mm. The exposure was 1/60 sec at f/8, using ISO 200. The Black and White conversion was made using Adobe Creative Suite 4 and Silver Efex Pro from Nik Software. Voltaire's prize for making it into the semi-finals is a StreetWalker camera backpack from Think Tank Photo. The contest, open to all Silver, Gold and Platinum Nikonians Members, results in monthly winners being announced, with each moving on to the finals at the end of the year. Our November segment is currently under way (and the deadline is Tuesday, Nov. 30). Please remember that the main subject for this segment is "Night Sky." The December theme will be "My Best Shot." For detailed information on entering, check our contest rules. Nikon Film Festival - 100K for 140 seconds! Now who wouldn't want to get paid big bucks for 140 seconds of work? The Nikon Film Festival celebrates outstanding media created using the latest hybrid cameras like the D300s, D90, D5000 and the D3s flagship. The winning video will garner USD100K (the audience favorite gets a consolation USD25K), but you've only got until 15-December, so get your best clips together and mind the time limit! Our latest edition of THE NIKONIAN is available for free download and it focuses on the biggest event of the Nikonians year, the Annual Photo Adventure Trip (ANPAT). 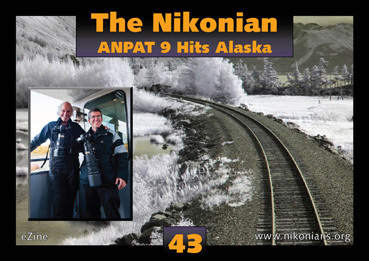 The 9th ANPAT was held in Alaska in Early September and some of the members who participated were kind enough to submit images and impressions of their adventure. We round out this ANPAT edition with a preview of a Nikonians Academy workshop next April which will enable Nikonians to experience the unique specialty of the Triple D Game Farm in Kalispell, Montana, USA. 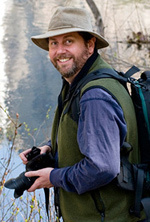 They will be photographing Triple D's wildlife models just outside of Mariposa, California. The Triple D Game Farm is a must-visit site for photographers seeking to capture images of wildlife from all corners of the Globe. 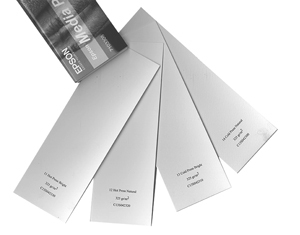 Epson has announced four new fine art papers. The new papers are described as photo and museum grade and will be available in cut sheets this month and rolls in early 2010. ►Cold Press Natural — Natural textured. ►Cold Press Bright — Bright textured. ►Hot Press Natural — Natural smooth. ►Hot Press Bright — Bright smooth. The Epson announcement includes sizes and prices in British Pounds (£). U.S. Dollar ($) prices are also available (click the "Fine Art" Tab near the top and the new papers will be the first ones listed) . DxO Labs has added to their automatic digital imaging enhancement software line-up with the introduction of DxO Optics Pro 6. The DxO software, designed for enthusiastic amateur and professional photographers shooting in JPEG or RAW format, is recognized for its unique automated optical corrections (distortion, vignetting, chromatic aberrations, lens softness) and its state-of-the-art RAW conversion. The new version announcement includes links for downloading free trials of the software, which can tackle such issues as noise removal, exposure optimization, keystoning correction, color control and dust removal. The software includes support for a long list of Nikon Cameras. ►More ergonomic user interface for better accessibility. 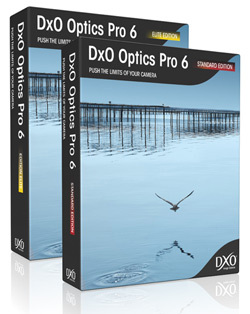 All customers who purchased DxO Optics Pro 5 after June 1st, 2009 are entitled to a free upgrade to version 6. All other users benefit from the following 40% discounts until December 31, 2009. ►DxO Optics Pro Standard (any version) to DxO Optics Pro 6 Standard: $ 44 instead of $79. ►DxO Optics Pro Elite (any version) to DxO Optics Pro 6 Elite: $ 69 instead of $119. DxO Optics Pro 5.3.6, fully compatible with Snow Leopard, is scheduled for end of November. It will also include support for additional camera bodies. Think Tank Photo has just released a major addition to their Urban Disguise line. The Urban Disguise® 70 Pro is a huge shoulder bag that can carry up to a 70-200 f2.8 lens attached to any camera body. 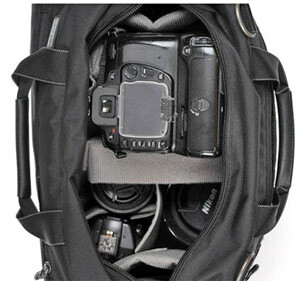 Think Tank's Press Release describes the new bag: For the photographer carrying two regular or pro size DSLRs with lenses attached to each camera body – or even a 70-200 f2.8 lens attached to any camera body – Think Tank Photo announces the release of the cavernous Urban Disguise ® 70 Pro. 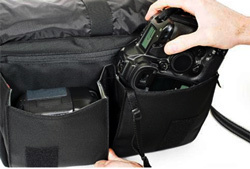 This is a briefcase style gear bag for traveling in style and protecting camera equipment without attracting attention as an obvious camera bag. The interior accommodates a host of camera configurations that enable photographers to keep all their gear secure in one bag. ● Secret pocket -- On the inside of the front pocket is a “secret” zipped pocket. It is designed to hold airline tickets, passports, and other irreplaceable items. ● Attaches to Rolling Bags -- The Urban Disguise 70 features a slot that allows it to be secured to a roller. A tab on the bottom prevents it from accidentally unzipping. ● Stretch pockets -- The pockets on either side of the bag stretch to hold items like cell phones, strobes, and even smaller water bottles. ● Business card slot -- The back of the bag has a slot big enough to hold many business cards so you can give them away to clients and friends. ● Rear zippered pocket – Ready access to magazines, notebooks, plane tickets, and other essential items. ● Shoulder Harness -- With Think Tank’s Shoulder Harness (sold separately) the shoulder bag converts into a backpack. Don't forget that if you use our special order form for Nikonian members Think Tank Photo will send you a free gift with your order.